Truth is One; wise men call it by various names. Both religious/spiritual philosophers and modern scientists have the same goal – pursuit of the ultimate truth. Science looks at “objective reality” independent of the human observer, whereas old Indian mystics adopted a holistic approach involving the observer and the observed – isolating the two is arbitrary. In terms of basic concepts, quantum theory contains some parallels to Hindu scriptures – the fuzzy and nebulous world of atoms sharpens into the world of reality only when an observation is made, similar to the Hindu concept of Aham Brahmasmi (I am Brahman). The well-known Schrodinger’s cat is a thought experiment illustrating this bizarre concept. The famous physicist John Wheeler’s thought experiment about the observer creating even retroactive reality is spectacularly confirmed by recent experiments on helium atoms scattered by laser light. Abstract concepts in Hindu scriptures are getting translated to real-world objective demonstrations in modern science and technology. For example, the Sanskrit sloka “Om Pūrṇamadaḥ, Pūrṇamidam, Pūrṇāt Pūrṇamudacyate, Pūrṇasya Pūrṇamādāya, Pūrṇamev āvaśiṣyate” can be illustrated by a hologram (Pūrṇa or Whole) recorded by coherent light generated by lasers. The śloka implies: That (pure universal consciousness) is full (perfect); this (manifest universe of matter, individual consciousness) is full. This fullness has been projected from that fullness; what remains is fullness. When the hologram is illuminated by light, the whole event is displayed as virtual reality, close to the concept of Māyā. One can cut the hologram into any number of small pieces; each piece contains the whole information and displays the event sharply. Manning AG, Khakimov RI, Dall RG, Truscott AG. Wheeler’s delayed-choice gedanken experiment with a single atom. Nat Phys. 2015. https://doi.org/10.1038/nphys3343. Gefter A. A private view of quantum reality. http://www.quantamagazine.org/20150604-quantum-bayesianism-qbism/. Friedman A. 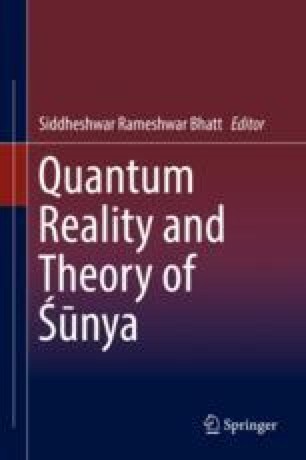 The nature of quantum reality. http://www.pbs.org/nova/blogsysics/2015/05/. See also Herbert N Quantum Reality, New York: Doubleday; 1985.